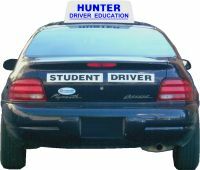 Hunter Driver Education is an Ontario Ministry of Transportation approved Beginner Driver Education (BDE) Course Provider. Our driver education program prepares new drivers for the Level One (G1) exit test under the Graduated Licensing System. For more information, see our Course Description or Contact Us. B. Hunter Driver Education Ltd. nominated for the 2012 Consumers Choice Award for Excellence in Service by The Caledon Chamber of Commerce! We serve students in Bolton, Palgrave, Caledon East, Tottenham, Schomberg, Kleinburg, Cedar Mills, Nashville, Coleraine, Tullamore, Wildfield, Mayfield, Sandhill, Macville, and beyond! Students who live beyond our area should consider meeting their instructor at our classroom for their in-car lessons. Do you have The Official MTO Driver's Handbook? Visit Forster's Book Garden at 266 Queen St. South, Bolton and Shop Locally!